Fact: Over the past 25 years, crime in major cities has fallen 66 percent. 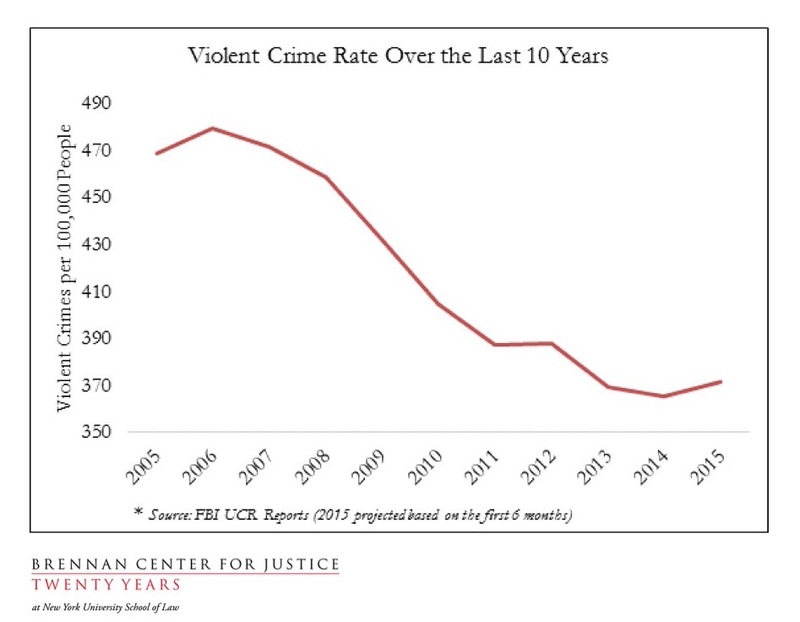 In the country as a whole, violent crime is half of what it was in 1991, and has gone down 26 percent in the last decade. Property crime is down 43 percent in the past 25 years. No single-year change has reversed that trend. Instead, the murder rate for 2015 remains close to 2012 levels — just barely above recent, historic lows. Fact: There is no national murder wave. However select cities have seen increased murders. A recent Department of Justice study showed the murder rate in the nation’s 56 largest cities rose by 16.8 percent in 2015. But two-thirds of that increase occurred in just 10 cities. A Brennan Center study of the 30 largest cities showed the murder rate rose by 13.2 percent in 2015. But half of that change occurred in just three cities — Baltimore, Chicago, and Washington, D.C. Murder nationally is still similar to what it was in 2012, at historic lows. For more information, see our recent report, Crime in 2015: A Final Analysis.